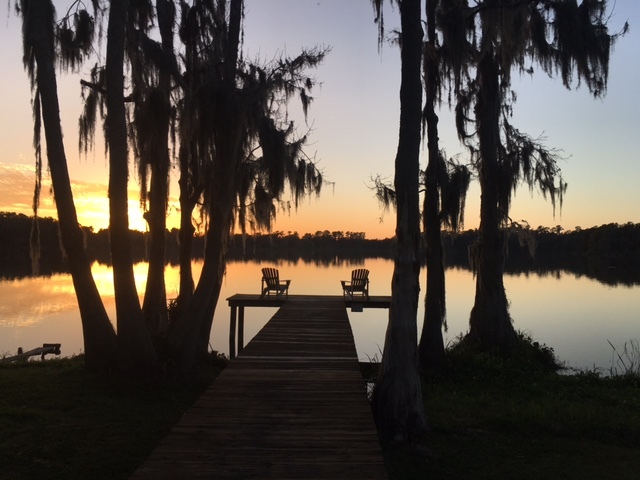 Trip Log – Day 394 – Gainesville FL | How Will We Live Tomorrow? Challenging things have occurred during this journey: gale winds, heavy rain, flat tires; but so far, never all at once. I was fortunate that yesterday’s flat was a slow leak that enabled me to roll to my host’s door in a university town full of cycle shops just before a layover day. First thing this morning I put Tom in shipshape, stopped by Super Cool Bikes, got another spare tube (I carry three) and topped off my tire pressure. Then I explored Gainesville. 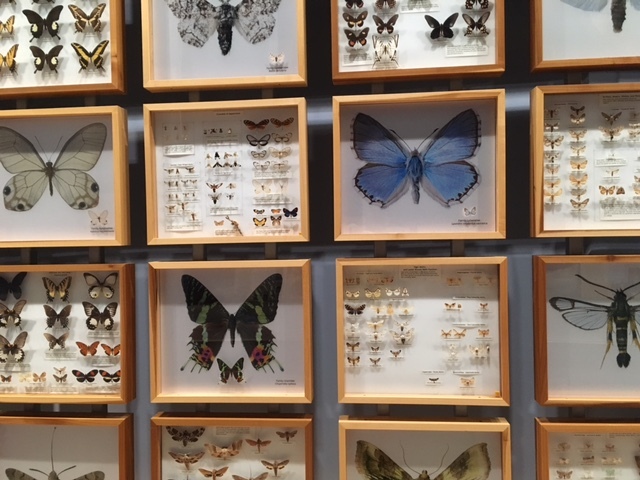 The Florida Museum of Natural History has the largest butterfly collection in the world – more than nine million specimens plus a huge butterfly cage. It also contains timely exhibits about Florida’s ecology. I suppose it makes sense that the last area of our country to take its present shape will be among the first to shrink as climate change continues. Easy come easy go in the land of sinkholes and real estate hucksters. The Harn Art Museum has intriguing exhibits despite few ‘name’ pieces. Shows about Frida Kahlo, African masks, The Guerilla Girls, and photojournalism of the Afghan war are all excellent. 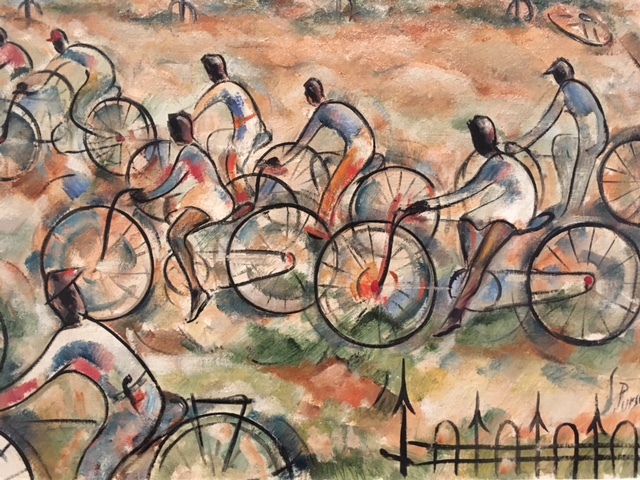 Of course I was drawn to Stuart Robert Purser’s whimsical painting of cyclists. I rode through University of Florida campus on a sleepy Saturday; most students are already gone for break. Downtown was even sleepier, though Gainesville has a lovely public library. 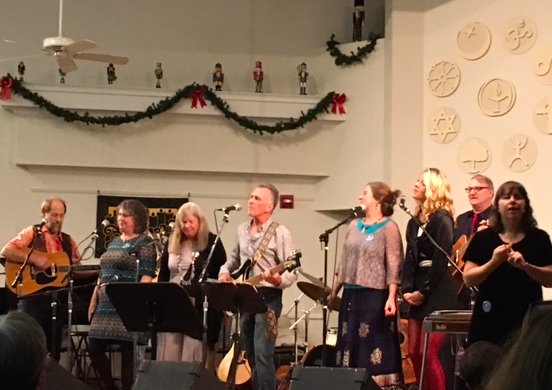 I headed to my next host’s early as she invited me for early supper before the Veterans for Peace Solstice Concert, an annual event that included some awesome musicians and one of the best Crosby Stills Nash and Young cover bands ever. Gotta love grey haired ex-hippies rocking out to ‘Carry On’ in the Unitarian Church. Gainesville FL, Lawrence KS, Austin TX, Laramie WY: blue bubbles amid our nation’s political red sea. This entry was posted in Bicycle Trip Log and tagged Florida Museum of Natural History, Gainesville FL, Harn Art Museum, Super Cool Bicycles, Veterans for Peace. Bookmark the permalink.